Duane Michals is a true storyteller, more so than many photographers. His storytelling has taken the shape of elaborate still-image sequences as shown in his books, The Journey of the Spirit After Death, and Sequences. 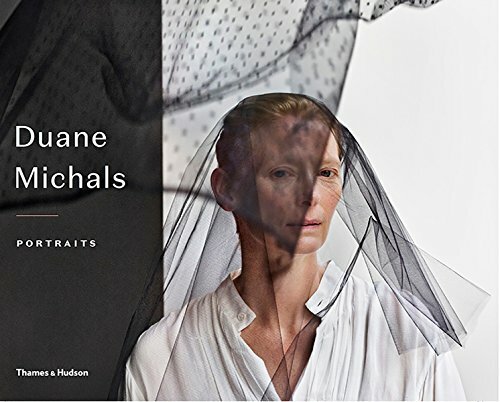 With his latest book, Portraits, Michals’ storytelling takes the turn of the written word having an equal or greater footing beside the photographic image. Beautifully printed, with large page-dominating photos, the book explains and complements the image with the word. Michals writes and editorializes about the image. Often his comments are stream of consciousness, psychologically probing, illuminating, and supplementary to such a degree that they would normally be excluded from how we interpret the photograph. The portraits are generally of celebrities in color and black and white, from Andy Warhol, to Merce Cunningham, Toshiba Mifune, Meryl Streep, Gilda Radner, and many others, and generally range from the 1960s to the late 1980s. There are the “straight” portraits as well as his signature multiple exposures. Michals worked as a freelance photographer for many high profile magazines such as Mademoiselle, Esquire, Vogue, etc., doing fashion photography and portraits. However, what is unique about his work was the ability to expand beyond the traditional photographic image into a more expansive contextualization by means of his sequenced storytelling, multiple exposures, and written text, which usher the viewer toward a more profound meaning. While a few of the images are the predictable stereotype celebrity photo, the majority are penetrating and intriguing, and bear Michals’ trademark of a slight twist on the image that makes you look again, such as the photographs of John Cassavetes, or Carol Burnett, or Werner Herzog. Michals generally avoids the sterility of the studio, preferring to photograph his subjects in their own element or environment, whether it be on the streets of New York City or their own apartments. It imparts a spontaneous quality to his images that is refreshing. Duane Michals: Portraits is an engaging book of black and white celebrity photographs. For those already familiar with Michals’ work this book will be new territory. And for those new to Duane Michals and longing for a different take on celebrity pictures, this book will be a welcomed look into an insightful photographer.